Bhu Devi yagna is a Vaishnava tradition to celebrate and pray to Mother Earth. Bhu Devi is actually Mother Earth. 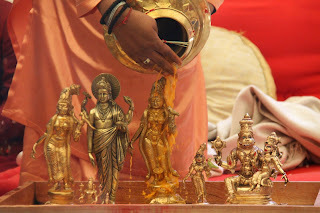 This yagna that we are doing is to show our gratitude and appreciation to Her, and also our understanding that She is going through a lot, not only now, but for centuries, actually. She has been taking a lot onto Herself, but people don´t see that this Mother is suffering. Its so easy to forget how important this Mother Earth is. We are here, we are born, yet we give Her so little attention. 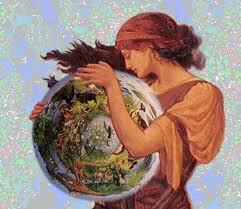 Mother Earth gives. She gives, gives, gives, not even expecting anything, nor taking. She is a manifestation of the compassionate, the ever-giving One and She is a manifestation of devotion also. One can pray to God but, you see, when you show your appreciation, when you show your thankfulness, you have to show it to the person, to the Deity. Everything is made with five elements. The whole Universe is bound by these five elements, but in the whole Universe, not everywhere has these five elements in action. The only place where you have the five elements in action is Bhu Devi. That’s why, among all the planets, the Earth is the most beautiful. We are very lucky. That’s why the Divine always manifests on Mother Earth. The prayer that we are going to do right now is called the Sudakshari Matri Puja. There will be sixteen invocations (into kalash), actually seventeen with the Bhu Devi, of all the forms of the Divine Mother. The sixteen aspects, forms and shakti of the Divine Mother, are actually the sixteen facets of the moon - called Nitya Kala - and also the sixteen qualities of Maha Vishnu. All these prayers which you will be chanting, all the mantras which you will be chanting, all of them will be transferred to the Mother Earth kalash, which in turn will be transferred to the whole world. We are going to chant the mantra Om Shrim Hreem Kreem Shreem Sri Devi Bhumavatiye Namaha. It is for Bhu Devi, Mother Earth. It is said that if someone chants this mantra 36 times daily one will, first of all, get rid of all the negativity inside oneself and, secondly, one will get peace in oneself and in the surroundings. Om is the king of all the mantras and it is actually also the root of Lakshmi mantra. The Om mantra is a primordial sound in itself. What happens when one chants Om, is that one is dissolving pride. The word Shrim, this bij mantra, is very powerful in itself as it destroys all the negativity and brings peace. Hrim is also a bij mantra of giving peace, but Krim is Kali, Aim is Saraswati, The bij mantra Shreem or Srim denotes Maha Lakshmi, the giver of boons, and the Sarva Shakti, the all-pervading Shakti. Maha Lakshmi creates also the balance. The balance in the elements, balance in yourself by purifying you, by cleansing all the negativity out of you, by uniting your body, mind and spirit, so that you can advance on your spiritual path. Then we have “Shree Devi Bhumavatiye Namaha”. This is the presiding Deity, Bhu Devi, Mother Earth Herself. When we chant the mantra, we invoke the Deity. Vibrationally the Deity is present. The Deities are vibrations. The moment you invoke them, call for them, they take their place and are present here with us. After that, they will be installed inside of each one of us because in reality we invoke them from deep within ourselves.